The Michigan Department of Natural Resources today announced that test results on fish collected in the ongoing fish kill event on Lake St. Clair were confirmed to be positive for viral hemorrhagic septicemia virus (VHSv). Fish were collected during late March and early April and included gizzard shad, bluegill, and black and white crappie. "A total of 165 fish have been tested thus far using pooled samples of five fish, and of the 33 pooled samples, 31 of them have been positive for VHSv," said Gary Whelan, research program manager for the DNR's Fisheries Division. "Ten gizzard shad were tested individually and all were positive for the virus. These results confirm what we initially suspected, given the external signs on the fish, species involved, and timing of the fish kill, all strongly implicating VHSv as the cause of this fish kill." Based on both public and other DNR and U.S. Fish and Wildlife Service reports, the current known distribution of the fish kill event is from Algonac to Lake Erie, with many of the reports from Harrison Township to St. Clair Shores. Initially, the fish kill was mostly gizzard shad, an important forage species, but now is widening to more species and is likely to affect tens of thousands of fish. This event is considered an unusually large fish kill but is smaller than an earlier VHSv-related fish kill in 2006. The reasons for the fish kill occurring this year are under investigation and the mortalities should begin to be reduced with water temperatures rising above 60 to 65 degrees Fahrenheit. VHSv is known to infect more than 30 species of Great Lakes fish and has been found in lakes Superior, Huron, Erie and Ontario, along with a few inland lakes. It is not a native pathogen and likely arrived in Great Lakes waters in the early 2000s. Some species such as lake sturgeon and walleye are very resistant to it and others such as bluegill, largemouth bass, muskellunge, gizzard shad and round goby are very susceptible. 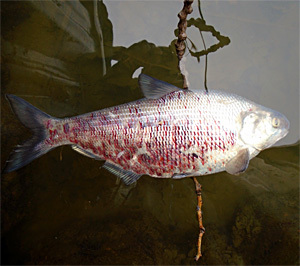 The pathogen causes the fish's blood vessels to leak, which is why the skin shows bloody patches and the fish ultimately dies of blood loss and organ failure. This external symptom is shared with other pathogens, which is why testing was needed to fully confirm if VHSv was involved in this event. Previous research has shown many fish recover from this virus infection, although there is no treatment. "The public has been essential in helping the DNR efficiently track and sample this event and is encouraged to continue to provide us with reports of fish kills with a focus on kills of more than 25 fish," Whelan said. "The public can provide the reports to DNR-FISH-Report-Fish-Kills@michigan.gov. We also ask that anglers be extra careful and be part of the team that prevents this virus from spreading to other waters." Anglers are reminded to refrain from moving live fish between water bodies and to properly dispose of bait. Boaters need to make sure their bilges and live wells are emptied prior to leaving a boat launch, and equipment must be cleaned and disinfected after use. Visit michigan.gov/fishing for more information on how those who fish and boat can help limit the spread of fish disease and invasive species. More information on viral hemorrhagic septicemia is available on the DNR website michigan.gov/fishhealth. The Michigan Department of Natural Resources is committed to the conservation, protection, management, use and enjoyment of the state's natural and cultural resources for current and future generations. For more information, go to www.michigan.gov/dnr.